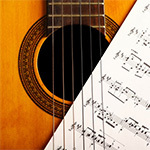 ▶ Why should I not rather study with my own local guitar teacher face-to-face for the same price? You can study with your local guitar teacher, but it is highly likely than he or she will not give you the same quality. I have studied with some of the greatest masters of guitar playing in the world and the information you will receive from me is impossible to beat! (Perhaps one or two other WORLD class guitarists on the web can provide similar info and quality, but you'll pay a similar price). I have been through the most rigorous study of my instrument and I've had immersion with the best of the best. To give you a comparison. If you really deeply care about your hair you would not just go to the local hairdresser because it's convenient. You would actually find someone who is an expert in cutting and shaping your hair in the style you need. If you buy ONLY on price, then I'm definitely not the right guitar teacher for you. However if you're looking for very high-quality and deep understanding of the very NATURE of the instrument you're trying to play, then you've arrived at exactly the right place! ▶ Can I learn touch/tapping guitar with you via correspondence guitar? ▶ You said that you’ve studied with some of the world’s greatest guitarists, who did you study with exactly? The most prominent guitar master I studied with was Johnny Fourie. He was recognised (world wide) as one of the rare true masters of Jazz guitar. I spend countless hours in a room with Johnny in Pretoria ,South Africa where he shared his intimate views on guitar playing with me. Johnny Fourie used to be the resident Jazz guitarist at Ronnie Scotts during the 60s. He was also a close friend and musical colleague with the formidable John McLaughlin (the world's best fusion guitarist). Johnny was the type of guitarist that's born once in a century. I vividly recall how he could play standard after standard in every key at any time of the day, harmonize it and play the most lush beautiful improvisations over the harmonies. On the classical guitar side I studied with a great master called Abri Jordaan. He's known as the top classical guitar teacher in South Africa. (He is also the guitar professor at the University of South Africa). He imparted a passion for classical guitar into my heart. I learned great secrets under him. On the rock/metal side I was primarily self-taught. My greatest influence in this realm is probably Yngwie Malmsteen. I just love his sound, technique and approach to guitar playing. Finally I had classical piano lessons with Josias Van Der Merwe. He's a master of piano interpretation. Although he is not known outside of music circles, he's on the likes of Claudio Arrau, Alfred Cortot and Dinu Lipatti. A true master! ▶ Are you the guy who play tapping guitar on YouTube with the many views, why should I learn how to play standard guitar with you? Well because my standard guitar playing is even more developed in a sense. I've played the guitar in the regular manner for more than 10 years before I even started to tap! I have a thorough understanding of Rock/Metal/Jazz and Classical Guitar having studied with some of the greatest masters in the world. My combined knowledge gives me a much deeper understanding about guitar playing than someone who only knows how to play metal guitar. When someone is a specialist, he or she will often try to solve a problem using one solution. Since I have intimate knowledge in many styles I will help you solve problems from many different angles and perspectives. Charlie Munger (who's Warren Buffet's partner) wrote a beautiful book called Poor Charlie's Almanack. In this book he explained that the world of finance is full of one-trick ponies. Among his favourite sayings are “To the man with the hammer everything looks like a nail”. He was referring to people with a one-track mind who only specialise in one subject without taking disciplines from a variety of subjects. Those individuals were always the most dangerous in the world of finance and often caused the collapse of entire organisations. They looked at problems from only one-view – their (limited) view. That's exactly what I'm not trying to do. I will use as many (result-orientated) views as possible to solve the problems you may have and turn you into the guitar king you've always wanted to be! ▶ I’ve seen online websites where I pay a small monthly fee that gives me access to over a thousand videos with many guitar instructors. Why should I pay you per lesson when I can get it all for a very small fee? You've got a fundamental misunderstanding about learning the guitar and correspondence lessons. Having access to a library of a thousand videos is what I call musical dessert! It's a bit of cake and ice-cream after a meal, but it will absolutely not make you grow! In fact it can be detrimental to your growth as you might spend countless hours playing material without any structure or understanding of what you do. The old saying you pay peanuts, you get peanuts still holds true today. 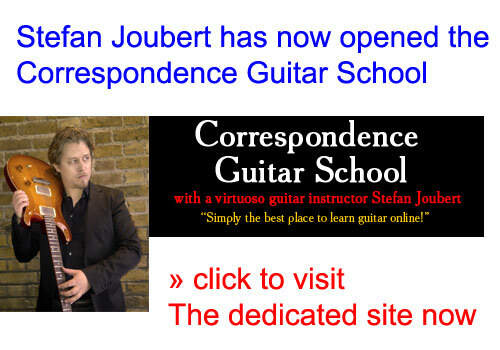 Correspondence guitar lessons is a personalised guitar program where I will work with you to greatly improve your playing and teach you how to play the guitar on a very high level. The material I present will not always be a shiny object, but it will hold substance and you will get more out of a dozen lessons then a lifetime of online guitar library video learning. I've had training with some of the world's best guitarists and musicians and the knowledge I've gained over the years far exceeds any shiny-object type lesson. I'm not saying you should not buy their product, but just remember it's a bit of fun. A musical dessert and holds very little true substance! ▶ I’m an absolute beginner and I have never played the guitar before is it still possible to take correspondence lessons with you? Yes, as long as you are willing to apply yourself and do the required practice involved. As a beginner learning the guitar might seem like a struggle initially, but with each tick of the clock (combined with practice) it becomes easier. All my very beginner students will receive a welcome pack with chords, music, video and audio. We will work through the basics and when you are ready we will progress to a higher level. ▶ Can I stop my lessons at anytime? A month's notice is require before stopping your lessons. The primary reason for this is that I spend a lot of time organising and arranging your personalised lessons for your benefit. I need to know when you intend to stop and so that we can plan accordingly. 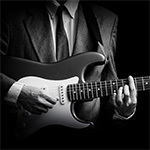 Please remember with correspondence guitar lessons that you can re-start your class at anytime. All the details of the work we've done together will be on file and we can take it from where your last correspondence lesson. ▶ I’ve studied with you privately, but now I want to enrol into your correspondence guitar course. Is that possible? Absolutely! It's always a pleasure to see previous students returning to learn the guitar. The truth is learning by yourself (without a mentor or guide) can be an extremely lonely and frustrating experience - and it will take many many additional years of trial and error to achieve your goals. Since I already have a working relationship with you it will be very easy for me to take your guitar playing to the next level. As always you're very welcome! ▶ I’m a bit skeptical, is it really possible to learn this way – you cannot see me in person! Yes it is absolutely possible. In this modern internet age, many people choose to complete MBAs and order degrees entirely via the internet with correspondence classes. Text books and materials get posted to them and they learn via a long-distance correspondence method. I don't need to see you in person to teach you how to play the guitar. With a combination of different learning methods, you will have an entire library of excellent guitar lessons at hand (for you to review at all times). 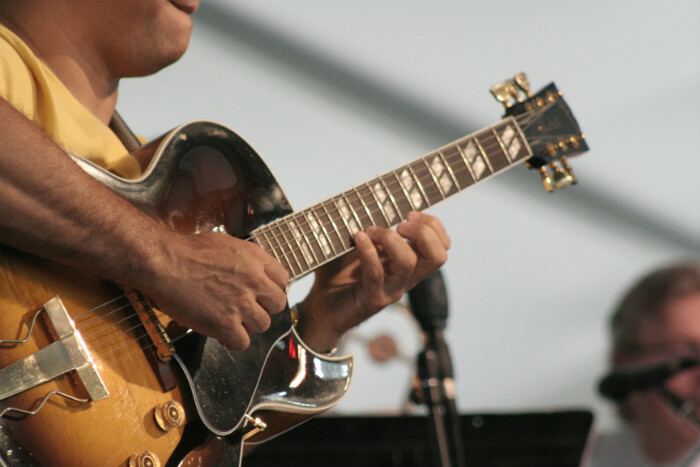 You will receive a lesson plan along with audio/video material to help you learn the guitar. To help you overcome your skepticism, imagine you learned guitar with a DVD that you've purchased from the internet. In this DVD the instructor shows you how to play the guitar using video and audio. I am sure you are not skeptical about learning from a DVD. The big difference is that you cannot talk to the DVD or ask questions regarding your vibrato, picking or left hand position! You will also not receive additional material that's bespoke to your personal guitar playing! The DVD is a one-way learning medium and it stops there. 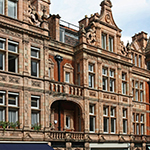 With correspondence classes there's interaction with a variety of methods and you will also be invited to all my social guitar events in Central London. It's in fact the perfect method to learn and you cannot get the same quality from a local guitar teacher. The minimum term is one month and you can evaluate for yourself whether it's worth it or not. I'm confident it is!